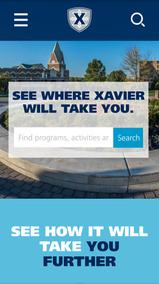 Last week I presented the first two answers to questions I sent along last year to Xavier to learn more about how they decided to position a “Search” box and the dominant feature of the university’s home page. worked well enough to make this change? gives us the fine-grained control that we desire. feedback from this round, but I think it was an important part of the process. needed and as requested by the departments on campus. regular review and looking at the search box will certainly be part of that. collaboration with other departments on campus. I’ll be looking forward to learning more about what “new” or first-time visitors search for most often. That’s a key indicator of the top tasks that website visitors want to complete. And creating a website that let’s people complete their top tasks as quickly and easily as possible is more important to marketing success than anything else on the site. This is also a fine opportunity to learn more about the language people, especially future students, use. Those are the “carewords” that will engage people throughout a website.